Back in April I posted an image of a Sphex sp. wasp with some odd structures on its legs. At the time I suspected the weird things were fungal growths. After some additional research (i.e., I found a photo of a bee with similar things on its legs while surfing the Internet), it seems that those structures are milkweed pollinia and not parasitic growths. Milkweeds (Asclepias spp.) are herbaceous perennials that tend to have brightly colored clusters of flowers with abundant nectar. 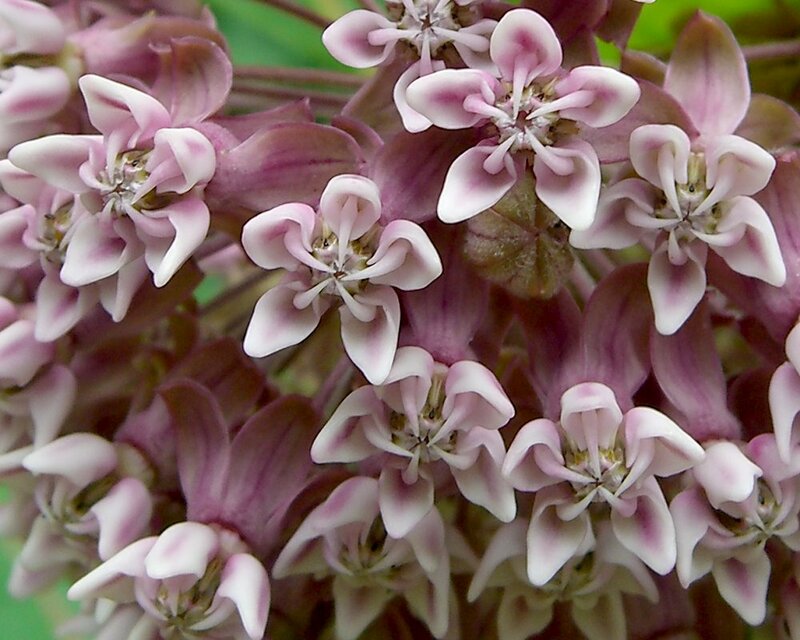 There are over 100 described species and subspecies of milkweed in North America. The monarch butterfly, Danaus plexippus (L.), may be the most well-known visitor to milkweed flowers, but milkweeds attract a large suite of butterflies, flies, beetles, bees, and wasps. Many people grow milkweeds for pollinators and other beneficial insects that feed on the plant’s copious nectar. [CC BY-SA 3.0], via Wikimedia Commons. Unlike most flowers, milkweeds do not produce loose pollen. Waxy masses of milkweed pollen are grouped into sacs called pollinia. 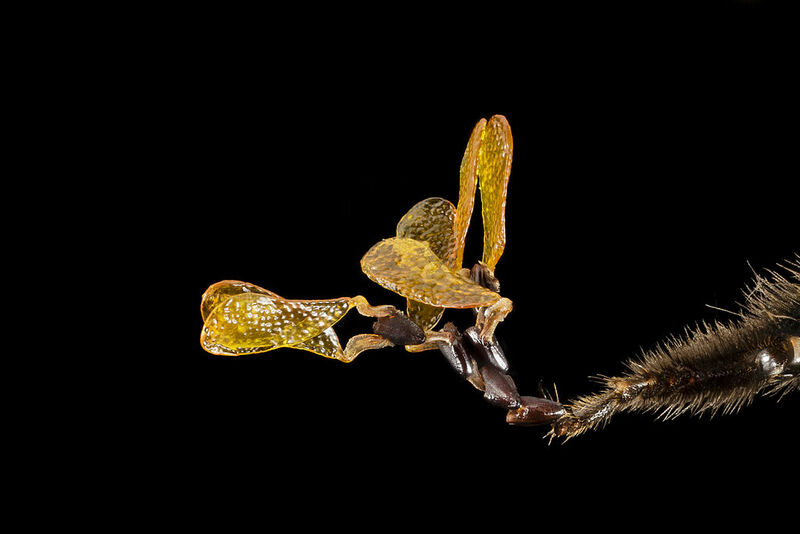 Orchids are the only other group of plants known to use pollinia. Bees don’t collect pollinia to use as food for their larvae the way they do with the loose pollen of other flowers. Nectar is a pollinator’s only reward for visiting milkweed flowers, but there’s a lot of nectar to be had on milkweed. The design of the milkweed flower is all about attracting pollinators with nectar and ensuring that the pollinators pick up and move pollinia to a different flower to complete pollination. Let’s take a look at the unusual structure of the milkweed flower to understand that process. Each individual milkweed flower has an attractive star-shaped corona on top of a short central column and with outward flaring petals below the column. 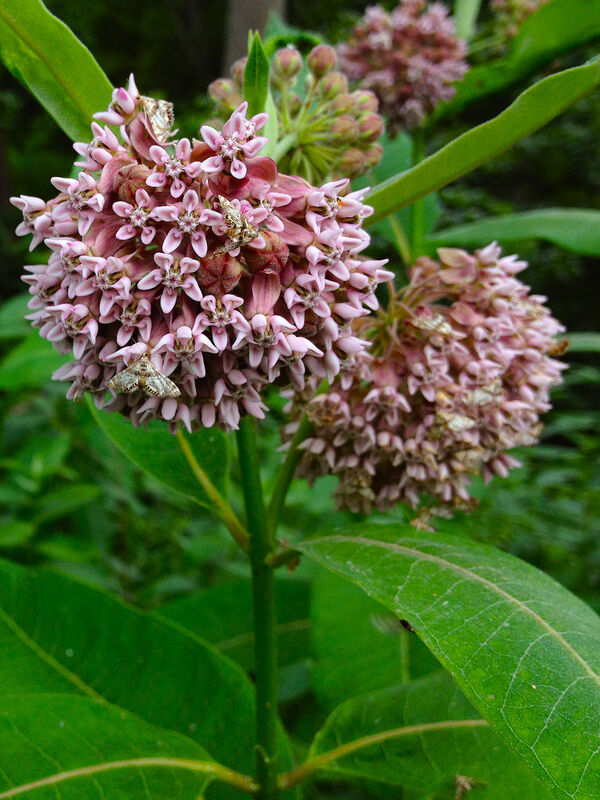 In the photo below of common milkweed (Asclepias syriaca L.), the corona is a lighter pink than the lower petals. Insects will find nectar on the top of the flower in those stars. Uploaded by Amada44) [CC BY 2.0], via Wikimedia Commons. 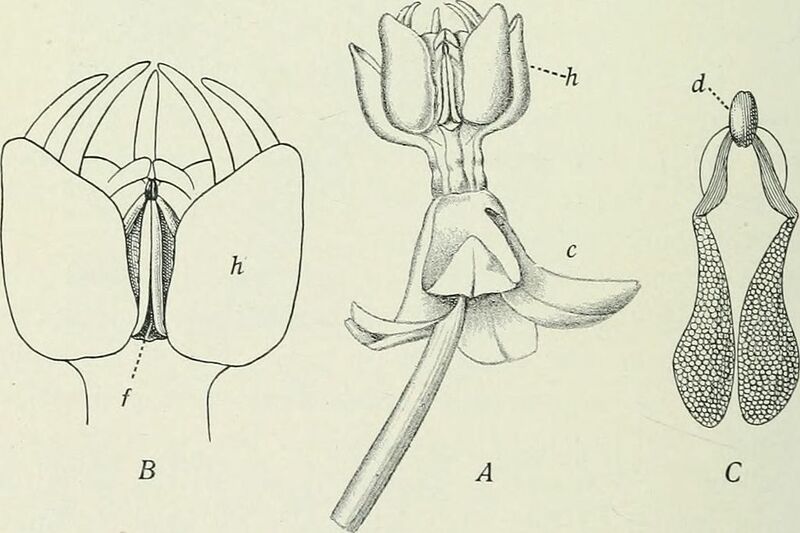 The botanical illustration below shows a milkweed flower from a lateral perspective. The star-shaped corona of a single flower (A) has five hoods (h) with a corolla (c) of lower reflexed petals. A closeup of a flower (B) shows a slit-like opening (f) between each hood formed by the fusion of the anthers at their top and bottoms. Each slit leads to the stigmatic chamber, where the pollinia are housed. Each pollinium (C) is a paired, winged structure with a central body (d). Botanical illustration of individual milkweed flower. Lab from Beltsville, Maryland, USA [CC BY 2.0], via Wikimedia Commons. Any insect large enough to acquire and transport the pollinia can serve as an efficient pollinator of milkweed (Ivey et al. 2003). 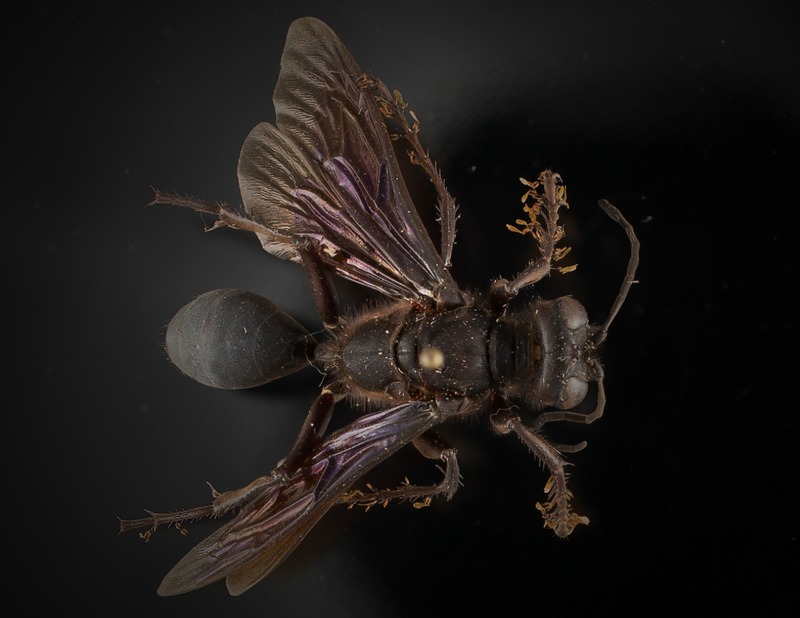 Some insects are not robust enough to remove their legs from the anther slits with the attached pollinia and are trapped to die there if they don’t lose their appendage first. Monarchs and other butterflies with their long, delicate legs are probably not as efficient in removing and transporting the pollinia as larger, more robust insects such as our katydid hunter (Sphex pensylvanicus L., seen below) with pollinia on its legs. Milkweed pollinia must be particularly sticky to the touch to ensure attachment to visiting pollinators. Those on the front legs of our specimen have remained attached to it since it was collected on 12 Aug 1952 by H. Jordan in Blacksburg, VA.
Photo taken by Pat Shorter of the Marek Lab, Blacksburg, VA.
Betz, R.R., R.D. Struven, J.E. Wall, and F. B. Heitler. 1994. Insect pollinators of 12 milkweed (Asclepias) species. P. 45-60 in T.B. Bragg and J. Stubbendieck (eds.) Proc. Of the Thirteenth North American Prairie Conference. Univ. of Nebraska, Lincoln, NE. Borders, B. and E. Lee-Mäder. 2014. 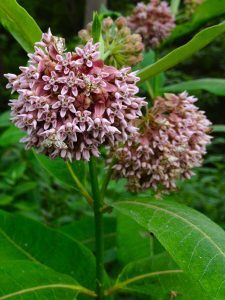 Milkweeds: a conservation practitioner’s guide. The Xerces Society for Invertebrate Conservation, Portland, OR. This entry was posted in Uncategorized and tagged natural history, pollination, pollinators. Bookmark the permalink.